1 Complete the steps in "Preparing the notebook" on page 55. 2 Remove the memory from the old system board and install it on the new system board by following the steps in "Adding or replacing memory modules" on page 57. 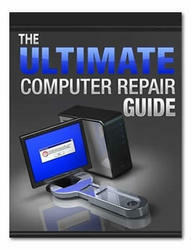 3 Remove the graphics card by following the steps in "Replacing the graphics card" on page 61. 4 Remove the hard drive(s) by following the steps in "Replacing the primary hard drive" on page 64 and "Replacing the secondary hard drive" on page 73. 5 If the notebook has wireless networking built in, remove the wireless card from the old system board and install it on the new system board by following the steps in "Replacing the IEEE 802.11 wireless card" on page 67. 6 Remove the keyboard cover by following the steps in "Replacing the keyboard cover" on page 78. 7 Remove the keyboard by following the steps in "Replacing the keyboard" on page 80. 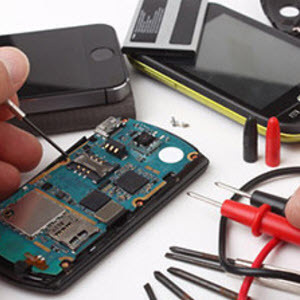 8 Remove the LCD assembly by following the steps in "Replacing the LCD assembly" on page 84. 9 Remove the palm rest by following the instructions in "Replacing the palm rest" on page 96. 10 Remove the modem by following the instructions in "Replacing the modem" on page 117. 11 Disconnect the Bluetooth and Express Card cables. Use a scribe or other non-marring tool to gently push the plugs out of the connectors. Remove the screws securing the old system board to the notebook. 13 Remove the system board from the notebook. 14 Turn the system board so the bottom is facing up. 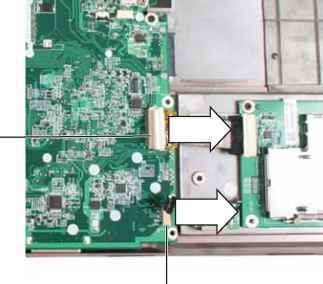 15 Remove the cooling assembly from the system board by following the steps in "Replacing the cooling assembly" on page 124. 16 Remove the processor from the old system board and install it on the new system board by following the steps in "Replacing the processor" on page 129. 17 Replace the cooling assembly by following the steps in "Replacing the cooling assembly" on page 124. 18 Insert the new system board into the notebook. 19 Replace the screws removed in Step 12. 20 Connect the Bluetooth and Express Card cables. 21 Replace the modem by following the instructions in "Replacing the modem" on page 117. 22 Replace the palm rest by following the steps in "Replacing the palm rest" on page 96. 23 Replace the LCD assembly by following the steps in "Replacing the LCD assembly" on page 84. 24 Replace the keyboard by following the steps in "Replacing the keyboard" on page 80. 25 Replace the keyboard cover by following the steps in "Replacing the keyboard cover" on page 78. 26 Replace the hard drive(s) by following the steps in "Replacing the primary hard drive" on page 64 and "Replacing the secondary hard drive" on page 73. 27 Replace the graphics card by following the steps in "Replacing the graphics card" on page 61. 28 If the notebook has wireless networking built in, reconnect the wireless antennas by following the steps in "Replacing the IEEE 802.11 wireless card" on page 67. 29 Replace the wireless bay cover by following the steps in "Replacing the IEEE 802.11 wireless card" on page 67. How to remove hard drive acer travel mate 6292? How to remove acer travelmate 6292 hard drive? How to replace acer laptop 6292 keyboard? How to install internal bluetooth card acer aspire 6930? How to install travelmate bluetooth device?